Whenever anyone asks me what Edmonton escape room they should try, the two companies I’m always recommending are Escape City and GTFO. Their rooms have quality storylines, set production, and puzzle variety (and complexity). You can’t go wrong at either, which is why I’m always excited when they come out with a new room, which is the topic of today’s blog post and giveaway! GTFO recently launched their new room Europa Colony 4836, a player vs. player room that pits two teams against each other in a race to get to the only escape pod remaining on a colonized moon of Jupiter after an unexpected meteor strike cripples the base. Fun, right? This is the first player vs. player escape room I’ve ever played. There have been rooms I’ve played where your group is split into two sections, but generally you’re trying to work together to solve the puzzles and get out of the room. GTFO’s Europa Colony 4836 adds a layer of competitiveness, where you go in split off into two teams and each team tries to solve their puzzles quickest in order to escape, and under 45 minutes. The winning team made it out in 17 minutes (but there was FOUR of them!) So in theory, we did better with our 19 minutes with THREE people, right? The suggested minimum number of players for this room is 4 (so you’d be split into a 2v2 match), which I think would be ideal for wanting most difficulty out of the room. We were at 3v3 and I did find that made the room move a little easier (it also likely helped that Mike, Brittney and I have collectively probably played over 60 escape rooms lol). Our opposing team who had less than a handful of escape room experience between them found the room challenging, so 3v3 is probably challenging enough, just depends on the escape room experience make-up of your team. Overall we really enjoyed Europa Colony 4836 (though it’s not my favourite at GTFO—Nightfall is my absolute favourite room there!) I think the player vs. player aspect is unique in Edmonton (at least, at the time of writing this blog post) and I did love how knowing we were competing against another team/our friends drove us to move even quicker than we maybe would have if we hadn’t been pitted against one another. They have an area in the room that shows you the progress your opposing team is making, which really pushes you to work even harder. There’s also a “New Game+” aspect to Europa Colony 4836, where if you do finish the game a little early and have time remaining in your 45 minutes, there’s a bonus challenge your entire team can work together to solve! Although we made it out of the main game in 19 minutes, we were not successful with figuring out the bonus challenge. It’s definitely a better one if you’re good at riddles (which none of us were…) but the extra game after the game was a really nice addition (especially if you do end up finishing early). So that sums up my latest escape room experience at my beloved GTFO! Now I’m excited to give away a free game of Europa Colony 4836 to up to 6 people. Our team did great at Europa Colony 4836! Our opposing team, not so much lol. Enter to win a free game of Europa Colony 4836 for up to 6 people (valued at $150). I’ll pick a winner by April 2, 2018! Note: Comments are moderated so don’t worry if your comment doesn’t appear right away! 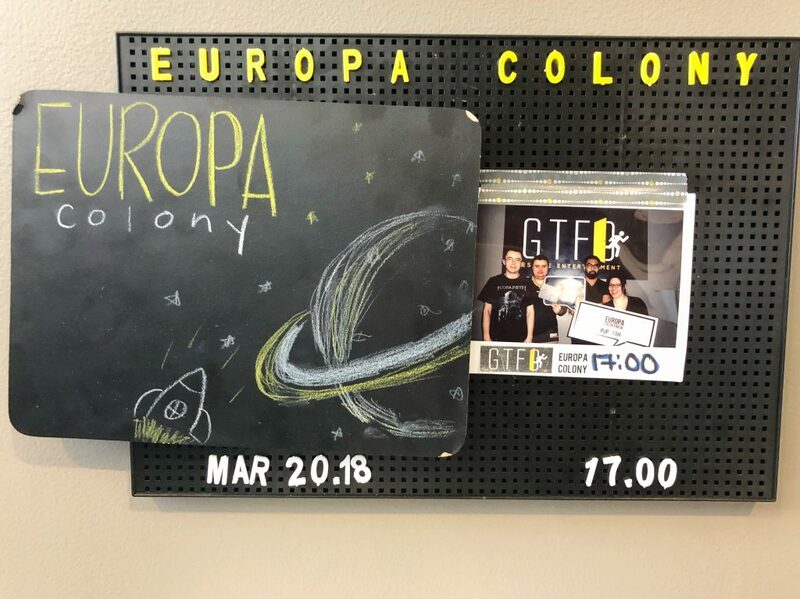 ** UPDATE ** Congrats to Donna E., the winner of a game for 6 to try GTFO’s new Europa Colony escape room! Thanks to GTFO for inviting me down to try their new Europa Colony 4836 and for giving me passes to giveaway to readers/followers! Disclaimer: GTFO invited me to try their new room (so the game was complimentary). This does not impact the opinions stated in this blog. 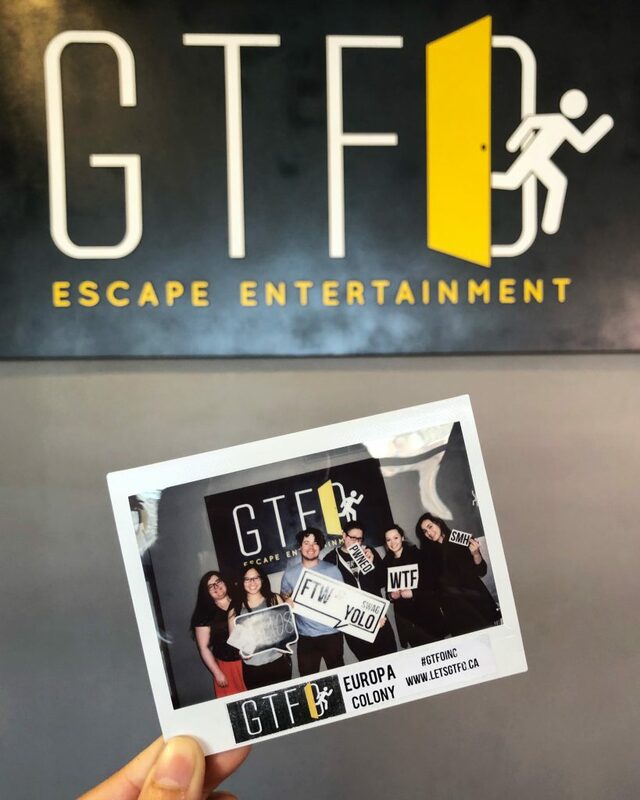 I love escape rooms and I love GTFO’s rooms! I love escape rooms because they are a fun group activity! Escape rooms are a great way to entertain our niece and nephews. I love to do escape rooms with friends, you find out what each other’s strengths are. I’m glad this type of gameplay has finally arrived! I love escape rooms because they force you to think about things differently while cooperating with friends! Everybody brings such a different perspective to the table and solving puzzles and getting competitive together is so much fun! Actually escaping the room is the best feeling. Only ever done one escape room but had so much fun. I love it cause it’s such a stress relieving thing you can do with your friends! Escape rooms are a good challenge! Fun! But keep the brain thinking different way! I did one escape room way back when they started and never went again because it was a poor experience but this sounds awwwesome! Heck, I’ll probably just go and check it out anyways! I love escape rooms Becuase they’re a great way to bond with friends and find out what people are like under pressure! I’ve never been to a escape room but this looks like so much fun. I love doing escape rooms with my friends because they are so fun and challenging, and it’s the best feeling when you actually escape. I think the reason I love them so much is because it momentarily makes you feel like a spy or detective 🤣 Puts me right in all the books I like to read! Love escape rooms! I love a challenge and being able to solve riddles and clues is so fun! We finally escaped one not long ago! … escape rooms are LIFE! Seriously though, escape rooms are the perfect way to challenge your brain mentally through a diverse array of puzzles! Plus, you can choose your super team comprised of your awesome friends! Escape rooms are the best. My friends and I Love the challenge and this new room will really bring out our competitive side! I love taking my kids to escape rooms! It’s the new version of board games for us! We just did our first escape room last night and it was SO FUN! I can’t wait to try again. We weren’t successful in escaping because we mussed the last hint that told us to cheat and tried to win with honesty lol. We’ve not yet tried an escape room but think it would be great fun for a family afternoon. Escape rooms are so fun! Great way to spend time with family and friends. Tried one last year with some friends and it was a blast, look forward to trying more! I LOVE escape rooms! I’ve done them for my birthday several times and I always have a blast. I’m a huge puzzle junkie, so they are one of my favorite group activities. I’ve done Nightfall and Visiting Hour at GTFO and both were so much fun, I’d love to try this new one! Love Escape Rooms because they show your friends strengths and creativity in a new setting. Such a fun way to spend time together! I love the social aspect, immersion, and solving the puzzle! I love the challenge and problem solving with friends ! Love escape rooms because they get the adrenaline pumping! Escape games make you think harder but different than real life. And it feels great when you succeed. I love puzzles and they are the ultimate puzzle/problem solver! Escape rooms are the best! I love doing a challenging room with my smartest friends 🤓 It’s such a rewarding and unique experience! I enjoy escape room because they put you out of your comfort zone and often make you think outside the box. Great prize. Escape rooms are so much fun and you really get to know your friends on a different level! I like being competitive and solving puzzles! I love solving puzzles with friends and family! Always so exciting! I have actually never tried an escape room. My 18 year old son goes quite often with his friends and they always have a blast so I’d like to try one out. I’ve always been a puzzle fan so I think that would help me succeed. I never tried a escape room as I’ve been always reluctant if I would enjoy it or not. I’m hoping an opportunity like this one will let me decide for myself! I love escape rooms because they challenge your brain to think outside the box, and we need to do that all the time! Plus they are super fun! For ages, I wanted to try escape rooms!! But I never got around to it!! I love the time pressure of solving puzzles and challenges with a group of friends! Escape rooms are challenging! And I love figuring out the challenges and questions! It’s super fun! I’ve never done an escape room but I’d love to try! Would love to bring my team to this for some team building event! This looks awesome – thanks for sharing!